What’s red and white and round all over? 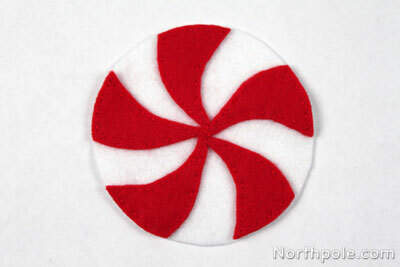 A fuzzy felt peppermint! This peppermint can be an ornament on your Christmas tree, a decoration on a wreath, or a festive embellishment for your home. 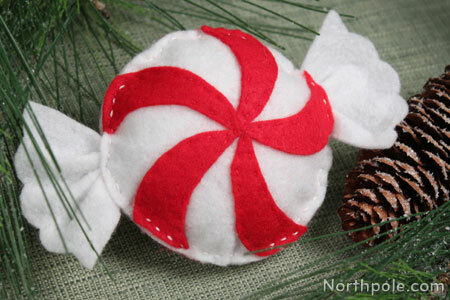 Use it as an appliqué on a holiday pillow, or scale it up and turn the mint into a pillow itself! 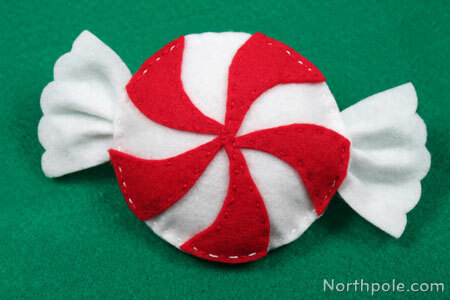 Use red and white felt for a traditional mint, or use green and white to make a spearmint candy. Trace pieces onto felt using the marker and cut out. 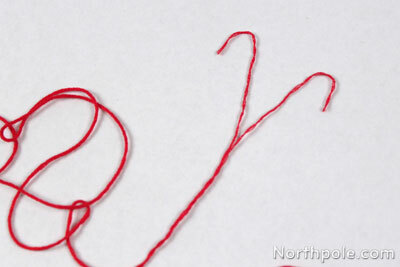 Cut a strand of red embroidery floss about 20" long (about arm’s length). Separate the strand in half. 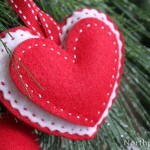 Thread the needle and sew the red swirls onto one white circle. Set aside. Take one side piece (for the twisty part of the "wrapper") and fold pleats along the edge that is opposite the scalloped edge. Fold one pleat and sew in place. 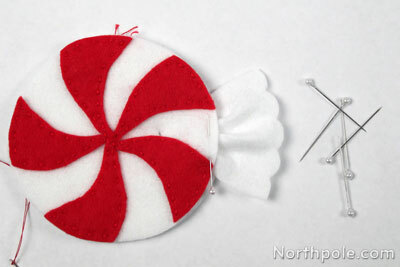 Be sure to sew within 0.25" of the edge so that the stitches are not visible once added to the peppermint. Add 2 more pleats, and tie off the thread. Repeat for other side piece. Stack the two felt circles together. 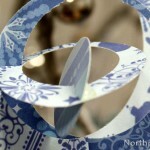 Place the pleated ends of the two side pieces in between the circles, overlapping the edges by 3/8". 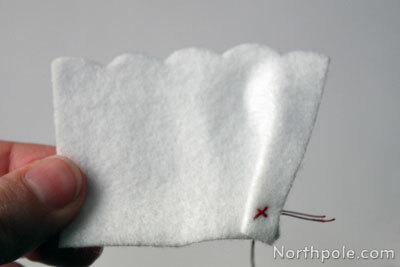 If you like, use pins to hold felt together while you sew. 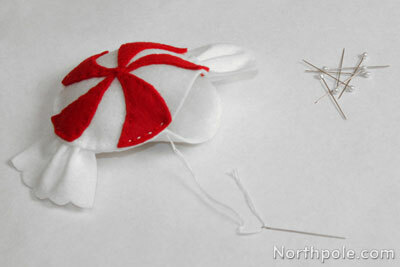 Begin sewing around the peppermint with white embroidery floss. We started sewing by one side piece and worked our way around the mint. 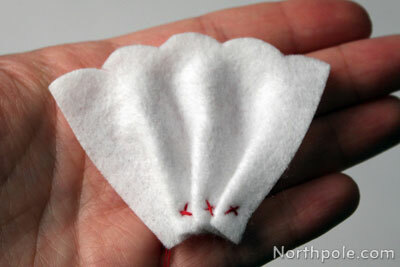 Once you’ve sewn about 3/4 around the mint, stuff with Poly-Fil®. Now your peppermint is finished! 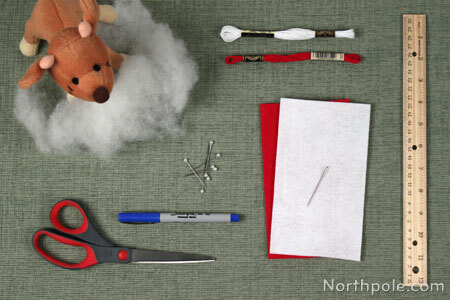 Turn this mint into an ornament by adding an ornament hanger: cut a piece of thin string, tie ends in a knot, and glue to the back of the felt circle (after step 4).